A tower of battered and fried sweet vidalia onion rings served with a ridiculously good chile aioli sauce for dipping. As you might already know, Nashville is one of my favourite cities ever for food. When we moved there for work a few years ago, this city was a surprise culinary hit for me and my then-Vegan husband. Nashville may not have as many restaurants as you would find in a city like Chicago or New York, but there seems to be a higher number of quality restaurants per capita. The sheer number of these that focus on food using health-conscious, fresh, local and sustainable ingredients is amazing. 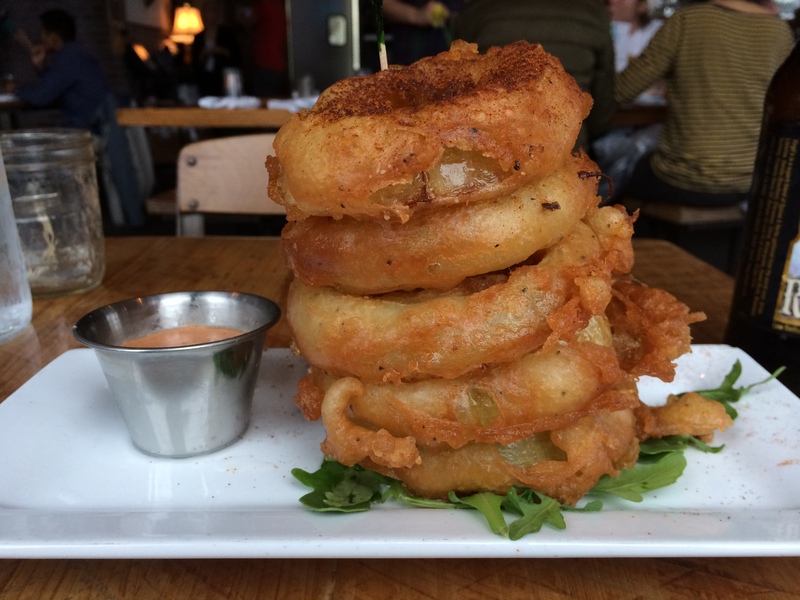 I debated posting this onion tower, not only because I don’t want to propagate the misconception that Nashville cuisine is all about deep-fried food, but because citing a pile of fried onion rings as delicious just seems a little too obvious. They’re onion rings. And they’re fried. Of course they taste great. And who hasn’t had delicious onion rings (piled in the shape of a tower or otherwise)? Yes, but you haven’t tried THESE onions rings. Or maybe you have, in which case you doubtlessly understand why I am writing about them. Because much like the incredible burgers at this fantastic establishment, these onion rings are particularly special and particularly delicious. Where do I start? I guess with the first thing that you notice upon biting into one of these beauties, which is that the exterior is perfectly crunchy and wonderfully seasoned. But when your teeth cut through that layer you are in for an even bigger treat, because they sink into the nice, thick, hot slice of sweet – yes, sweet! – Vidalia onion that literally melts in your mouth. But wait, there’s more! Because as delicious as those onion rings are, they would be nothing if it weren’t for the spicy, pink, ridiculously addictive sauce that comes alongside them. I’d also like to give a nod to Burger Up’s yummy Root Beer n’ Roses in-the-bottle craft cocktail. 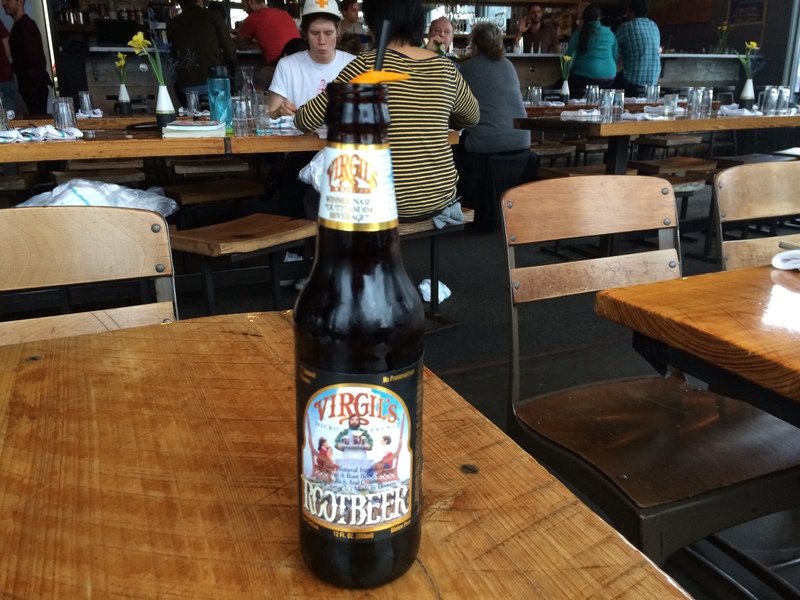 Burger Up takes a cold bottle of Virgil’s Root Beer, pours some of the root beer out, and replaces it with Four Roses Bourbon and Orange Bitters. So delicious and fun to drink. I love everything about this restaurant! These onion rings look magnificent, so much better than the paltry things bought in the freezer section of a supermarket in England. Mind you, when I first arrived in Spain, not knowing any Spanish, I bought a bag of onion rings from the local store and they turned out to be octopus made by Dunlop ! I can see why you love this restaurant! Yum to the onion rings and sauce and YUM to the root beer cocktail. Brilliant. That could inspire a wave of soda bottle cocktails. I can imagine them lined up on your bar as you entertain 🙂 Orange dreamiscles with whipped cream vodka, rum and cokes, highballs, whiskey gingers, … Happy weekend, HotDish. Thanks Liz! I have to admit, I added that cocktail with you in mind. 😉 Have a great weekend yourself! Where have you been? Happy New Year! I wish you a prosperous 2018!! !